"Since the beginning of the Industrial Revolution, the release of carbon dioxide (CO2) from human activities has resulted in atmospheric CO2 concentrations that have increased from approximately 280 to 385 parts per million (ppm). The atmospheric concentration of CO2 is now higher than experienced on Earth for at least the last 800,000 years and probably over 20 million years, and is expected to continue to rise at an increasing rate, leading to significant temperature increases in the atmosphere and oceans in the coming decades. "The oceans have absorbed approximately 525 billion tons of carbon dioxide from the atmosphere, or about one third of the anthropogenic carbon emissions released. This absorption has benefited humankind by significantly reducing the greenhouse gas levels in the atmosphere and minimizing some of the impacts of global warming. 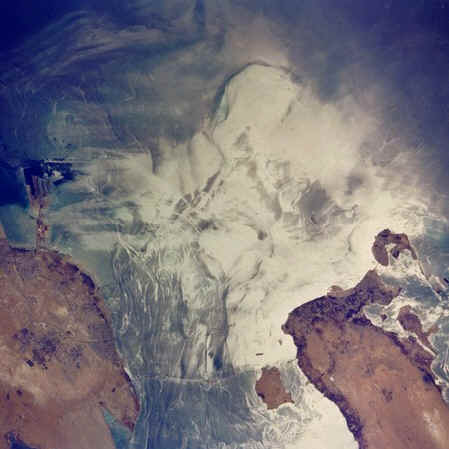 However, the ocean's uptake of carbon dioxide is having negative impacts on the chemistry and biology of the oceans. Hydrographic surveys and modeling studies have revealed that the chemical changes in seawater resulting from the absorption of carbon dioxide are lowering seawater pH. The pH of ocean surface waters has already decreased by about 0.1 units from an average of about 8.21 to 8.10 since the beginning of the Industrial Revolution. 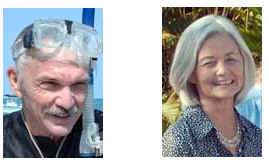 Estimates of future atmospheric and oceanic carbon dioxide concentrations, based on the Intergovernmental Panel on Climate Change (IPCC) CO2 emission scenarios and coupled ocean-atmosphere models, suggest that by the middle of this century atmospheric carbon dioxide levels could reach more than 500 ppm, and near the end of the century they could be over 800 ppm. This would result in an additional surface water pH decrease of approximately 0.3 pH units by 2100. Global warming is caused by the accumulation of carbon dioxide and other heat-trapping gasses in the atmosphere. These gases act as a blanket, preventing the heat of the sun to escape through our atmosphere. This is primarily due to fossil fuel burning and deforestation and many scientists believe that this is causing sea surface temperatures to rise. Ocean warming is extremely dangerous to coral organisms, which are very sensitive to changes in temperature. Increased water temperatures, which may be linked to global warming, can cause mass coral bleaching. This occurs when coral polyps, stressed by heat or ultraviolet radiation, expel the algae that live within them. These algae, called zooxanthellae (zo-zan-THEL-ee) normally provide the coral with up to 80% of its energy, making zooxanthellae essential for coral survival. The algae are also normally responsible for the color of coral, so when they are expelled, the coral appears white or "bleached." There is a chance that bleached coral can recover if conditions return to normal quickly enough. However, in the face of other human-induced pressures, corals have become vulnerable. In many cases, bleached coral colonies die. This is referred to as "bleaching". In the past several years there has been an unprecedented number of "bleaching" events world wide. In the past few decades, the amount of carbon dioxide in the air has increased by one-third. This is harmful to corals because increased amounts of carbon dioxide are dissolving into the water, which appears to be dissolving the skeletons of corals. As a result, coral in waters with large amounts of carbon dioxide form weaker skeletons, making them more vulnerable to damage from waves, careless tourists, and destructive fishers. Scientists have identified pollution as one of the leading causes of coral reef degradation. This threat comes from a variety of sources. For example, oil, gas and pesticide contamination poisons coral and marine life. Reefs are harmed when human, animal waste and/or fertilizer is dumped into the ocean or when river systems carry these pollutants to reef waters. These pollutants increase the level of nitrogen around coral reefs, causing an overgrowth of algae, which smothers reefs by cutting off their sunlight. 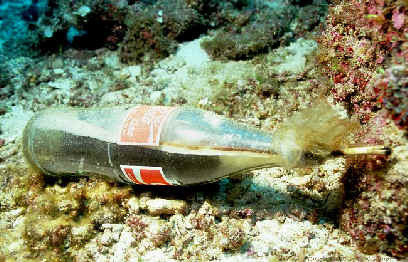 Trash also kills coral reef animals. Floating trash can cover reefs, blocking off sunlight that polyps need to survive. Turtles often mistake plastic bags for jellyfish and eat them. Plastic blocks the turtle's digestive tract, causing them to starve to death. Lost or discarded fishing nets - called "ghost nets" - can snag on reefs and strangle thousands of fish, sea turtles and marine mammals. They are dumped directly into the ocean or carried by river systems from sources upstream. Some pollutants, such as sewage and runoff from farming, increase the level of nitrogen in seawater, causing an overgrowth of algae, which 'smothers' reefs by cutting off their sunlight. Construction along coasts, inshore construction, mining, logging and farming along coastal rivers can all lead to erosion. As a result, particles end up in the ocean and cover coral reefs. This 'smothers' coral and deprives it of the light it needs to survive. Mangrove trees and seagrasses, which normally act as filters for sediment, are also being rapidly destroyed. 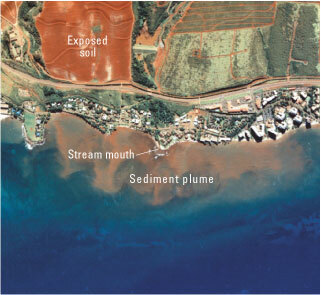 This has led to an increase in the amount of sediment reaching coral reefs. Mangrove forests are often cut for firewood or removed to create open beaches. They are also destroyed by prawn harvesters to open up areas to create artificial prawn farms. Coastal populations have risen, increasing the pressures on coastal resources. This has led to a multitude of problems for coral reefs. 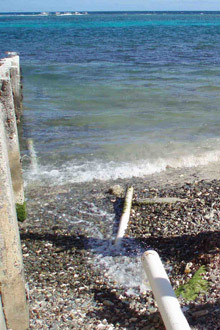 In many areas, developers have constructed piers and other structures directly on top of coral reefs. At one time, big cities such as Hong Kong, Singapore, Manila and Honolulu had thriving coral reefs. Long ago, these reefs were destroyed by human pressures. Now, reefs growing near other coastal communities are experiencing the same coral degradation. Unfortunately, some current fishing practices are destructive and unsustainable. These include cyanide fishing, overfishing and blast fishing. Although cyanide fishing supplies live reef fish for the tropical aquarium market, most fish caught using this method are sold in restaurants, primarily in Asia, where live fish are prized for their freshness. To catch fish with cyanide, fishers dive down to the reef and squirt cyanide in coral crevices and on the fast-moving fish, to stun the fish making them easy to catch. Although some large tropical fish can metabolize cyanide, smaller fish and other marine animals, such as coral polyps, are poisoned by the chemical cloud produced during this process. 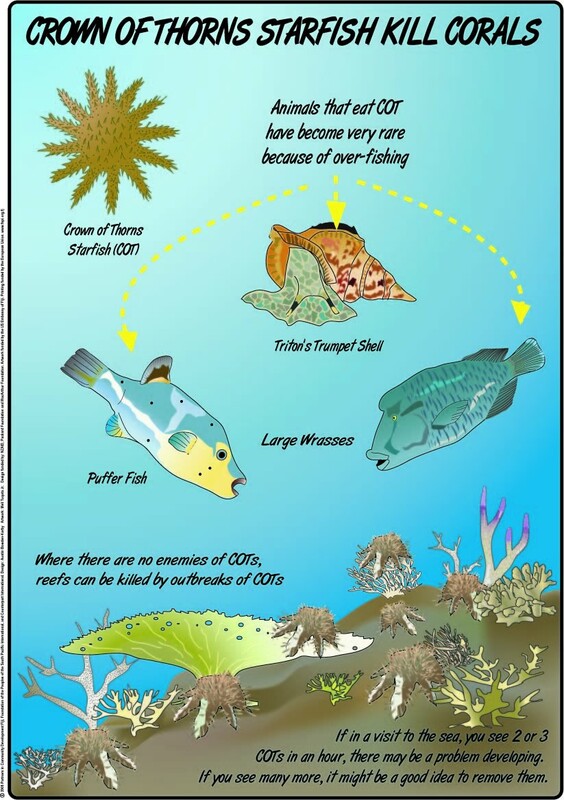 Overfishing is another leading cause for coral reef degradation. Often, too many fish are taken from one reef to sustain a population in that area. Poor fishing practices, such as banging on the reef with sticks (muro-ami), destroy coral formations that normally function as fish habitat. 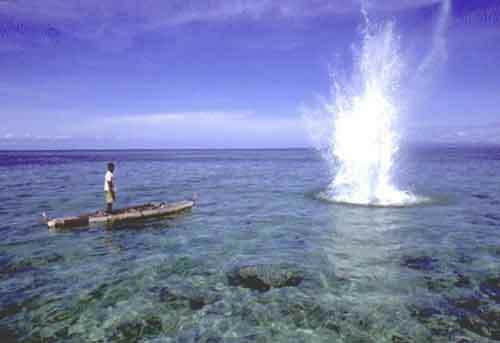 In some instances, people fish with explosives (blast fishing), which blast apart the surrounding coral. Mining also destroys coral. Sometimes coral pieces are removed for use as bricks or road-fill. Or, sand and limestone from coral reefs are made into cement for new buildings. But corals aren't only removed from their habitat for construction; they are also sold as souvenirs. Coral curios and jewelery are often sold to tourists and exporters in the markets of developing countries. Tourist resorts that empty their sewage directly into the water surrounding coral reefs contribute to coral reef degradation. Wastes kept in poorly maintained septic tanks can also leak into surrounding ground water, eventually seeping out to the reefs. Careless boating, diving, snorkeling and fishing can also damage coral reefs. Whenever people grab, kick, walk on, or stir up sediment in the reefs, they contribute to coral reef destruction. Corals are also harmed or killed when people drop anchors on them or when people collect coral. The destruction of the ozone layer, which accompanies global warming, is caused by the presence of chlorofluorocarbons (CFCs) and other chemicals in the atmosphere. This presence causes the depletion of protective ozone in the atmosphere and increases the intensity and nature of ultraviolet radiation that reaches the earth's surface. Although corals have a natural sunscreen to protect themselves from the tropical sun, most scientists believe that increased levels of ultraviolet radiation damage coral in shallow areas. Coral reefs face numerous threats. 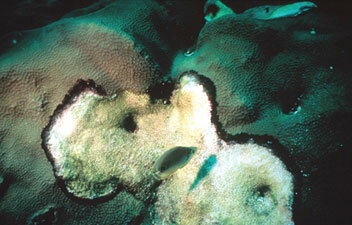 Weather-related damage to reefs occurs frequently. Large and powerful waves from hurricanes and cyclones can break apart or flatten large coral heads, scattering their fragments . A single storm seldom kills off an entire colony, but slow-growing corals may be overgrown by algae before they can recover . Reefs also are threatened by tidal emersions. Long periods of exceptionally low tides leave shallow water coral heads exposed, damaging reefs. The amount of damage depends on the time of day and the weather conditions. Corals exposed during daylight hours are subjected to the most ultraviolet radiation, which can overheat and dry out the coral's tissues. Corals may become so physiologically stressed that they begin to expel their symbiotic zooxanthellae, which leads to bleaching, and in many cases, death. Corals face serious risks from various diseases, including black-band disease. The susceptibility of corals to disease may be on the rise as a result of human activities. Increased sea surface temperatures, decreased sea level and increased salinity from altered rainfall can all result from weather patterns such as El Niño. Together these conditions can have devastating effects on a coral’s physiology . 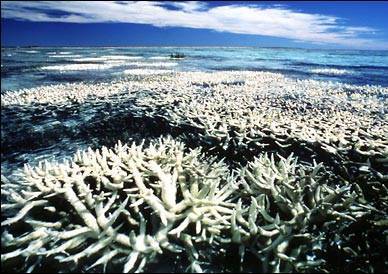 During the 1997-1998 El Niño season, extensive and severe coral reef bleaching occurred in the Indo-Pacific and Caribbean. Approximately 70 to 80 percent of all shallow-water corals on many Indo-Pacific reefs were killed. In addition to weather, corals are vulnerable to predation. Fish, marine worms, barnacles, crabs, snails and sea stars all prey on the soft inner tissues of coral polyps . In extreme cases, entire reefs can be devastated by this kind of predation. 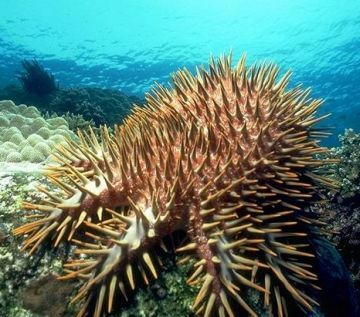 In 1978 and 1979, a massive outbreak of crown-of-thorns starfish (Acanthaster planci) attacked the reef at the Fagatele Bay National Marine Sanctuary in American Samoa. Approximately 90 percent of the corals were destroyed. Coral reefs may recover from periodic traumas caused by weather or other natural occurrences. If, however, corals are subjected to numerous and sustained stresses including those imposed by people, the strain may be too much for them to endure, and they will perish.